For a family-friendly day trip or weekend, visit Pennyrile State Resort Park in southwestern Kentucky. You’ll love the lake beach, paddle-boating and canoeing, horse trails, biking trails, and hiking trails. 6.5 miles within park, although several trails that start within the park continue for several miles into Pennyrile State Forest, which surrounds the park. No handicap-accessible trails, but mostly flat hiking. On leash only. No dogs on beach sand. None, except on special occasions (e.g. full solar eclipse Aug. 21). Standard campsites (capacity: 8) cost $20 per night. Equestrian campsites cost $32. Cottage and lodge reservations are $100 and over per night. Designated a Kentucky State Park in 1954, Pennyrile State Resort Park is named for the tiny Pennyroyal plant that grows in the wooded area. Though the park is only 863 acres, it’s surrounded by a 15,331-acre state forest, and many of the park’s trails continue out of the park boundaries into the state-protected forest. Pennyrile is located in southwestern Kentucky, an easy drive from cities like Nashville, TN, and Louisville, KY. Pennyrile is a resort park, meaning it hosts a variety of permanent facilities for visitors to enjoy, including a central lodge and numerous cabins for rent. The gem within Pennyrile is its 56-acre lake. Surrounded by a 2.6-mile loop hiking trail, Pennyrile Lake is perfect for a relaxed afternoon of pedal-boating, row-boating, kayaking, and/or canoeing. Visitors can rent boats from the resort or bring their own. Since no diesel engines are allowed on the lake, non-motorized boats can enjoy a rare dose of calm and quiet. A public beach affords the opportunity for sunbathing and swimming. The resort also boasts a basketball court, a tennis court, an 18-hole golf course, a miniature golf course, a horseshoe pit, and three children’s playgrounds. 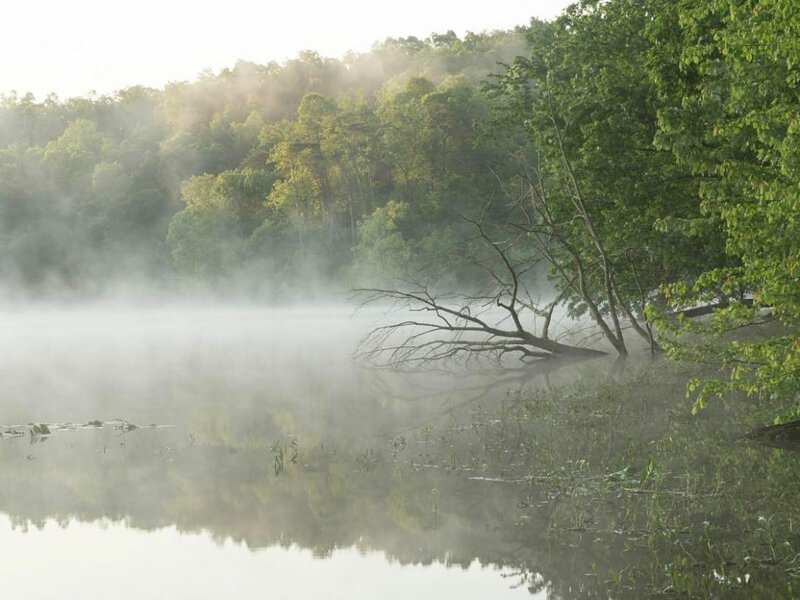 The park’s seven hiking trails amount to only 6.5 miles total but connect visitors to more than a dozen miles of hiking in the surrounding Pennyrile State Forest. Certain trails are open to mountain bikers. Bird-lovers will delight at the spring influx of Rose-breasted Grosbeaks, the lake-loving Louisiana Waterthrush, and many more species seen at different times of the year. The lake also supplies ample fishing: bluegill, channel catfish, crappie, and largemouth bass all inhabit the lake. Note that a Kentucky Fishing License is required. Pennyrile’s 36-site campground (open April 1 - October 31) features utility hook-ups, showers, restrooms, and laundry facilities. The campsites can be used for RVs or tents. Equestrians can reserve one of eight pull-through campsites designed for horse owners, providing easy access to Pennyrile State Forest’s 40+ miles of horse trails. While you won’t feel isolated camping at Pennyrile, the park’s campgrounds are situated on the edge of the forest, out of view from the park’s other facilities. Nothing in the park is more than a mile from the lake, so you’ll have a short walk to the park’s main attraction. For those desiring a more luxurious overnight getaway, rustic cottages and guest rooms in the central lodge are available for rent year-round. Cottages are one or two bedrooms, with kitchens and cooking utensils provided. Lodge rooms include daily maid service. Pennyrile State Resort Park is a family-friendly vacation spot, with educational programming for all ages and lots of short, easy, hiking trails. Tired parents who want an outdoorsy weekend—but don’t want to deal with a tent—can rent a cabin for the family. Anyone who loves to be on the water will enjoy all that Pennyrile Lake has to offer, and horseback riders will especially appreciate the horse-friendly equestrian camping and convenient access to horse trails that surround the park. When navigating to the park, follow signs for the lodge—that’ll be your center for information, and that’s where you’ll find the main guest parking. Pennyrile doesn’t charge any general admission fees or parking fees, though all overnight stays require reservation fees (camping, cabins, and lodge). The beach often gets crowded on weekends, especially holiday weekends, but generally there is plenty of parking for visitors. Information for reservations can be found here. Written by Caroline Leland for RootsRated in partnership with Kentucky Tourism.